Season 8, Episode 1 of the Muller Monthly Music Meta is here. Eight years! This has been a lot of fun and I’m glad Pete has renewed for at least one more year. 17a. [Place for parsley, sage, rosemary, and thyme] = HERB GARDEN. Raise your hand if you started typing SCARBO… here and then realized that this entry isn’t a grid-spanner. 39a. [Colorfully named area of mathematics that uses “city block” distance instead of “as the crow flies” distance] = TAXICAB GEOMETRY. New to me. Each of those phrases contains the letters BG, so you might label them “BG’s” leading to contest answer the Bee Gees. Fun little amuse-bouche to start the year off, 4.00 stars. And I believe we pick up next Tuesday the 5th with the February puzzle but someone correct me in comments if that’s not true. 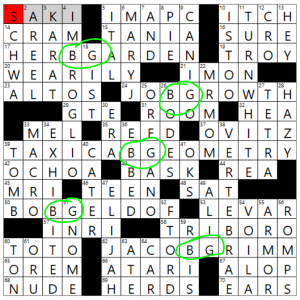 And a nice title to the puzzle, plus a nice job sneaking MARY J. Blige in at 6-D.
And that’s right – next puzzle is Feb 5 – I better get to constructing! ” I better get to constructing!” – Really? You, my friend, are nuts!!! And insanely talented. Seriously! And that it’ll be the right level of difficulty… here I assumed Pete made a bunch of these in advance. Matt, what do you mean “sneaking” MARY J. Blige in ? You’re lucky to get anything with ? ?R?J pre-placed, but having it also be a music-related entry is nice.